Irish playwright and author Oscar Wilde has had a cult following for years. Wilde’s canon is a bit of a short read compared to England’s other literary giants. But the plays he wrote became classics of Victorian polite society, and the play genre known as comedy of manners and drawing room styled plays. A brilliant intellect, and a master of wit infused with a poet’s appreciation for words, Wilde relished elegant dialogue and sophisticated situations both on and off the stage. He was a true sybarite. Which, unfortunately, led to his fall from grace. His meteoric rise to popularity and acceptance by London’s theatre-going society immediately propelled him into the upper ranks of England’s playwrights mainly on the strength of “An Ideal Husband”, “A Woman of No Importance”, “Lady Windermere’s Fan”, and “The Importance of Being Earnest”. His daring novel “The Picture of Dorian Gray”, only solidified his writing credentials as a novelist, playwright, essayist, and celebrity of his day. 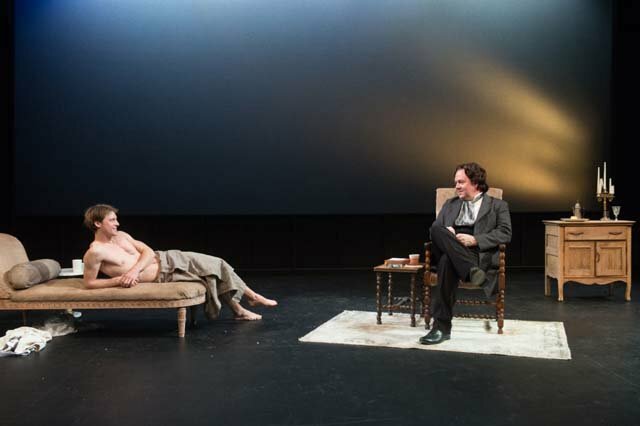 The English playwright David Hare (“Constellations” (2015) and a fan of Wilde’s work felt that Wilde deserved a play, as a way of setting the record straight on Wilde’s larger- than- life philosophy in what Tennessee Williams called “that of which we dare not speak”. Wilde was a Bi-sexual gay man who loved to flout the English law of ‘”gross indecency”. But if one did, one did so at one’s peril. If arrested, both men would face jail time and the ruin of their reputations. Wilde’s trial resulted in his going to prison for two years of hard labor. And true to predictions his career was over. The law of ‘gross indecency’ that ensnared Oscar Wilde was only removed from the English law books in 1967. At curtain up, Michetti’s staging sets the tone of Hare’s drama and its relationship with the world of. sexuality We find hotel bellman Arthur (Matthew Campbell Dowling and fetching housemaid Phoebe (Mara Klein) ‘starkers’ beneath the sheets of the suite rented by Oscar Wilde (Rob Nagle, in a fabulous, performance). A knock on the door, sends Phoebe and Arthur scrambling to retrieve their clothes; scattered about the floor. Sandy Moffat (Will Dixon), Concierge-extraordinaire enters and sternly surveys the room giving Arthur and Phoebe glowering looks and instructions to clean up the suite before abruptly turning on his heel leaving Oscar’s first lover an anxious Robert Ross (Darius De La Cruz); patiently waiting outside the door for Oscar to arrive. Ross is making sure that the reluctant-to-leave-England Oscar, is safely away into exile on the Continent before the police can arrest him to stand trial for breaking England’s ‘gross indecency’ statute of homosexuality. Lord Alfred “Bosie” Douglas, a spoiled, petulant, weak, young man of privilege and the current lover of Wilde (Colin Bates) bursts into the suite looking for Wilde with important information involving their relationship. When Wilde eventually does arrive he informs everyone that he has no intention of fleeing to France. He’s staying put despite the risks. To divulge any more of Act One would diminish the impact of Hare’s story and Michetti’s, crisp, creative directorial touches. Suffice it to say, there are plenty of moments of declarations and recriminations by Wilde, Lord “Bosie”, and Ross for the audience to relish. Act Two takes place two years later in 1897 in The Villa Giudice, in Naples Italy. Wilde has served his prison sentence. Now, however, we see a weary, chastened, and resigned Oscar, who is in a mood to review his life in discussions with “Lord Bosie” (his betrayer) and Bosie’s new boy-toy Galileo Mosconi (Kurt Kanazawa) who speaks only in Italian. Nagle’s highly nuanced, immersive, tour de force performance including gestures, pacing, and his modulated vocal delivery, are gems in their own right and worth the price of admission alone. It’s obvious that Oscar’s zest for the world of endless parties, gourmet food, and the lifestyle of a hedonist is now behind him. What Wilde also left behind for us to enjoy are his epigrams and a plethora of witticisms. Two of my favorites of his are: “Be yourself; everyone else is already taken” and “I can resist everything except temptation”, words he really took to heart. He died in 1900 at the tender age of 46 from meningitis. For me, the meat and beauty of this intriguing play and production lies is the performance of its talented ensemble cast who are always in their on-stage moments. However, as talented as this cast is the evening belongs to Rob Nagle as Oscar Wilde. His astonishing performance is a true star turn worthy and of the great Noel Coward’s comment about talent. One has to have “star quality” to make it in this business. Nagle’s stamina is stunning in its execution. He is on stage in Acts One and Two for over an hour and a half; delivering an actor master class on how to hold an audience in his thrall. Good writing is a must for actors. Great writing elevates the performance of everyone in the production. The technical credits for “The Judas Kiss” are first rate. The creative team led by director Michetti includes a set design by Korean designer Se Hyun Oh; the outstanding Costume designs of Diane K. Graebner are highly detailed and spot on for the Victorian period. The lighting design is provided by David Hernandez, with Peter Bayne, composer and Sound Designer, Courtney Lynne Dusenberry as Props Designer; Shannon Hutchins, Wig Designer, and Accent Coach Nike Doukas complete the creative team. “The Judas Kiss” is an impressive production that makes for a splendid evening of theatre that performs at the Boston Court Theatre, Pasadena, through March 24, 2019.